I don't think I have made any secret of the fact that I am a bit Tudored out and so I am being very selective about the books that I read that are set during the Tudor period of British history. When I saw that this book was coming out though, there was no question for me as to whether I would read this or not. 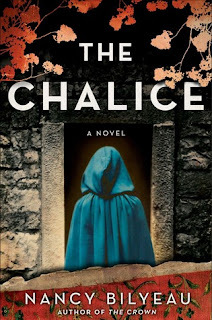 Bilyeau's debut novel, The Chalice, which features a novice nun named Joanne Stafford who comes from a disgraced noble family was a good read for me last year but I did have some issues with the pacing. 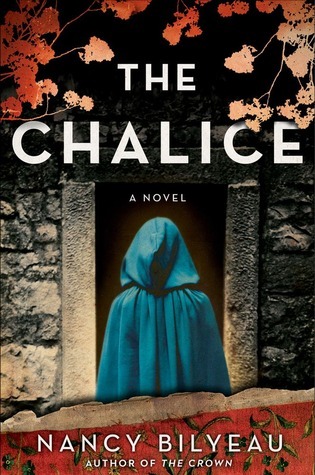 Everything I enjoyed about The Crown was present, but The Chalice is by far the stronger book of the two. The pacing is strong and consistent, the mystery is interesting, the plot twists and turns, the historical facts are fascinating and the characters are captivating! After the dissolution of the monasteries, former novice Joanna Stafford is trying to make a home for herself in the town of Dartford in Kent. It is difficult to be out in the community, especially given that the town isn't particularly welcoming to the former nuns and friars. In addition to the former sisters who share her life, Joanna also has custody of a young boy, Arthur, who is the son of her cousin who was executed for committing treason in the previous book. Joanna knows that she needs to find a way to make a living and so has a plan to start producing tapestries. She just needs her loom to arrive from the low countries and she will be able to start working and live a nice, quiet life with the only dilemma for her being her love life. At the end of The Chalice things were kind of unresolved, which made sense given that Joanne had a religious vocation. She definitely felt a strong connection to Geoffrey Scovill, a constable that she met when he saved her from a mob at the beginning of the last book, and a strong emotional connection to Brother Edmund, the apothecary who is a constant in her life. When her cousin and his wife suddenly show up in Dartford with an invitation for both Joanna and Arthur to visit with them, it is a surprise to Joanna. She has no intention of being drawn back into the world that comes with being a member of one of England's most infamous families and related to many of the other noble families like the Howards. Only agreeing to accompany her cousin as long as she does not have to attend Court, Joanna goes with them to London. Despite her protests, Joanna is drawn into a complicated plot that relies strongly on a prophecy that concerns her. Suddenly her quiet life is a long way behind her as she finds herself faced with the responsibility of trying to restore the Catholic faith to England. The last thing that Joanna wants is to fulfil the terms of the prophecy but life conspires to bring Joanna to a place where she has very little choice. The plot is constantly evolving and bringing Joanna into different situations, even having her travelling to Flanders. Joanna is not always blindly following fate, for want of a better word, especially once there are people starting to die around her. There were a couple of times when she did do a couple of things that had me shaking my head, but she is also able to find a resolution to the prophecy that enables her to be who she wants to be. I did find the resolution to be very interesting, especially with the way that Joanna was introduced to both Anne of Cleves and Catherine Howard. I would think that Joanne will be back at court with everything that we know is going to happen regarding those two women in the future. One of the pieces of history that I learned about during reading this book was about a law that was passed by Henry VIII that prevented anyone who had taken religious vows from being able to marry. Once again this left those former nuns and brothers with few options. They could no longer fulfil their religious obligations but they also could not become fully immersed in secular life either and it had very interesting implications for the story. Once again, the book ends with some ambiguity in relation to Joanna's future. Which just left me with one major question when I finished the book ...when is the next one out? Nice review, Marg. I really enjoyed this one, too, although I don't know that I liked it any better than I did The Crown. It seems most readers do think this one to be better though. From memory, I thought that there were times in The Crown where the story dragged a bit, but this one grabbed my attention and kept it from the get go! I got this one in the mail, and I am eager to read it. I loved The Crown, and I am so excited to hear you say that this was the better of the two. Thanks for the excellent review today, Marg! Good review Marg, I really enjoyed this one too, gave it the same rating. I couldn't find any info on the next book? ?